The local Police have been issuing reminders for people to bring their wheelie bins inside their yards as there have been a few set alight recently. Penkhull is a safe place to live and we all want to keep it that way! To do this I have started an experiment, I have set up a reporting map for Penkhull residents. 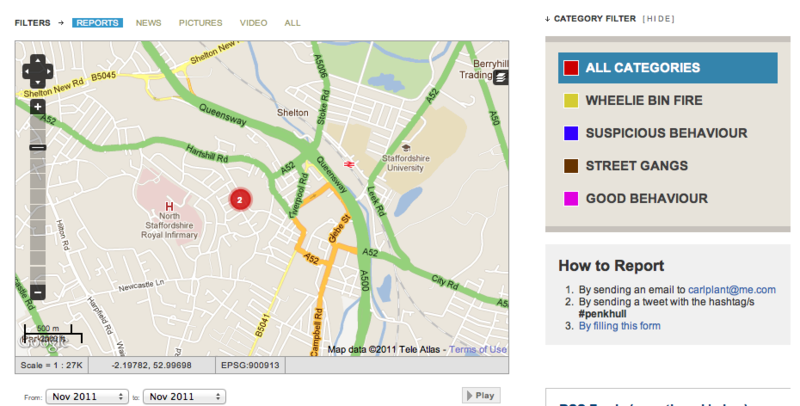 This map allows you to report any suspicious behaviour as well as reporting issues such as petty crime. PLEASE report crime to the Police first, this map is not a replacement however we can share any issues such as dodgy door to door activities or gangs of people hanging around. You can report anonymously (you don’t have to say who you are) on the map and DO NOT have to place the report right on your doorstep just your street. When you send in a report it will not appear straight away on the map, the reports will be moderated to stop any personal details being added. Please consider reporting and sharing the GOOD things too that happen in Penkhull!! Excellent Post Carl. I love the bottom line. Anything that gets residents to take an interest in ‘Welcome to Penkhull’ is good. Cheers Geoff, please share this idea to help get some traction, especially during the darker nights.